Natural Restorations is on BizBash ~ Click HERE to see Natural Restorations listed as one of 3 new ideas for Entertaining in Phoenix/Scottsdale. Natural Restorations on the Radio ~ Nicole returned to the Valley Focus program to interview with Valerie More on Sunday, January 6th and 13th, 2019. Nicole promoted our 01/19/19 10th Annual Environmental Stewardship Event at Hewitt Station with Footprints Matter to Us on the Tonto National Forest. Click below to listen to the interview, it takes a minute or so to start playing. Our 2nd Annual Green Friday Lower Salt River Cleanup on 11/23/18 was highlighted in Superstition Living Magazine’s January issue. You can view all of the pictures from these event HERE. Our 2nd Annual Lower Sycamore Cleanup on 10/20/18 was highlighted in Superstition Living Magazine’s December issue. You can view all of the pictures from these event HERE. Natural Restorations on the Radio ~ Nicole returned to the Valley Focus program to interview with Valerie More on Sunday, October 14th, 2018. Nicole promoted our 10/20/18 2nd Annual Lower Sycamore Cleanup on the Tonto National Forest. Click below to listen to the interview, it takes a minute or so to start playing. 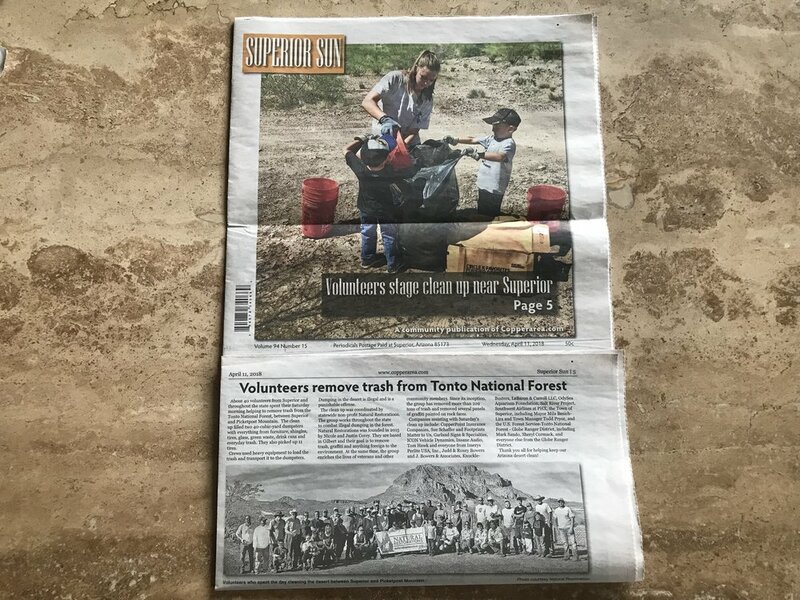 Our 04/07/18 Desert Cleanup between Superior and Picketpost Mountain made the front page of the Superior Sun! You can view all of the pictures from these event HERE. Natural Restorations on the Radio ~ Nicole returned to the Valley Focus program to interview with Valerie More on Sunday, February 4th, 2018. Nicole promoted our 02/17/18 Salt River Cleanup with Friends of the Tonto National Forest. Click below to listen to the interview, it takes a minute or so to start playing. Natural Restorations on the Radio ~ Nicole returned to the Valley Focus program to interview with Valerie More on Sunday, January 7th, 2017. Nicole promoted our 01/20 9th Annual Stewardship Event with Footprints Matter to Us, along with volunteer events on 2/03, 2/17, and 4/02. Click below to listen to the interview, it takes a minute or so to start playing. Natural Restorations Benefits People & Places Throughout Arizona ~ Autumn 2017 edition of the Arizona Trail Association Newsletter. Click HERE and go to page 3. Natural Restorations on the Radio ~ Nicole returned to the Valley Focus program to interview with Valerie More on Sunday, November 19th, 2017. Nicole promoted our 11/24 Green Friday Cleanup along with volunteer events on 1/21, 2/03, 2/17, and 4/02. Click below to listen to the interview, it takes a minute or so to start playing. Natural Restorations on the Radio ~ Nicole returned to the Valley Focus program to interview with Valerie More on Sunday, October 15th,2017. Nicole promoted our 10/21, 11/24, 1/21 and 2/03 volunteer events. Click below to listen to the interview, it takes a minute or so to start playing. Natural Restorations is in the News ~ We were featured in the Arizona Daily Sun for our 09/10/17 Cleanup along the Arizona Trail in Flagstaff. Click HERE to read the article. Natural Restorations on the Radio ~ Nicole was a returning guest on Flagstaff Mornings with Peter Bruce on Friday, August 25, 2017. Nicole promoted our 09/10/17 Cleanup Along the Arizona Trail Behind Mary's Cafe and our 09/23/17 Cinder Hills OHV Area Cleanup. Natural Restorations in on 12News ~ We were featured on 12News bringing attention to our Dedicated Restoration Team. Click HERE to watch the video and read the story. Natural Restorations in the News ~ We were featured in the February 2017 issue of Green AZ Living. The article is called Loved to Death? A Popular Recreation Area Needs A Helping Hand, click HERE to read the article. Natural Restorations on the Radio ~ Nicole returned to the Valley Focus program to interview with Valerie More on Sunday, January 15th, 2017. Nicole promoted our 1/21, 2/18, and 3/11 volunteer events. Click below to listen to the interview, it takes a minute or so to start playing. Natural Restorations in the News ~ We were featured in the September 2016 issue of Green AZ Living. The article is called Natural Areas in Arizona Get Much Needed Love, click HERE to read the article. Natural Restorations in the News ~ Copper Area News printed an article about our upcoming community cleanup event with Footprints Matter to Us on Saturday, October 1st, to support the town of Superior. Click HERE to read the article. Natural Restorations Named Recipient of the Buffalo Exchange Token for Bags® program - July through December. You can now donate to Natural Restorations just by shopping at Buffalo Exchange in Phoenix. The Tokens for Bags® program offers every customer who opts to use a reusable bag (or to not use a bag at all) one “token” valued at $.05 USD (the cost to produce a bag) to donate to one of several local charities selected by the store employees. Natural Restorations on the Radio ~ Nicole was a guest on Flagstaff Mornings with Peter Bruce on Wednesday, July 13th at 7:37 a.m. airing on KAFF 93.5 FM, KAFF 107.9 FM, and KAFF 930 AM. Nicole promoted our July 16th Trash Cleanup along the Arizona Trail near Walnut Canyon. Natural Restorations on the Radio ~ Nicole returned to the Valley Focus program to interview with Valerie More on Sunday, April 24th at 5am & again at 6am on 93.3 KDKB, 97.9 KUPD, 100.7 KSLX, and 1440AM KAZG. Nicole promoted our April 30th Trash Cleanup off Old Florence-Kelvin Highway. Natural Restorations named Semi-Finalist in Social Venture Partners (SVPAZ) 2016 Fast Pitch Program for innovative non-profits leading change in Maricopa County. Click HERE to request a copy of the News Release. Natural Restorations Cleans Up Pinal County ~ Winter 2015 edition of the Arizona Trail Association Newsletter. Click HERE and go to page 5. Natural Restorations Cleans Up the Coconino ~ Autumn 2015 edition of the Arizona Trail Association Newsletter. Click HERE and go to page 5. Natural Restorations Cleans Up the Arizona Trail ~ Summer 2015 edition of the Arizona Trail Associations Newsletter. Click HERE and go to page 4. Natural Restorations on the Radio ~ Nicole was a guest on the Valley Focus radio program with Valerie More on 08/09/15 and 08/16/15 at 5am & again at 6am on 93.3 KDKB, 97.9 KUPD, 100.7 KSLX, and 1440AM KAZG. Nicole promoted our 08/15/15 Trash Cleanup outside Flagstaff and our 10/17/15 Broken Glass & Trash Cleanup at the Florence-Kelvin Trailhead of the Arizona Trail.